Husk has become synonymous with Southern food and great Bourbon. The Bar at Husk boasts a collection of over 100 bourbons, including a Reserve list and Exclusive Husk Single Barrel Picks. The Bar at Husk offers guests various experiential tasting options, including learning the basics of bourbon as well as tasting rare finds and hard to get bourbons. Structured as a 1-hour tasting experience, groups of 8-30 people join Bar Manager Justin Simko on a guided tasting journey. 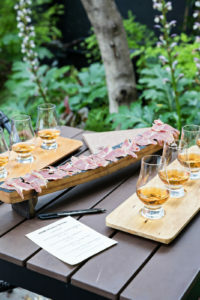 Depending on group size, tastings may be offered in the upstairs cocktail lounge or outside on the Patio at Husk. Interested in reserving private event space? The Bar at Husk is perfect for welcome receptions, private happy hour gatherings, birthday parties and corporate retreats. Both the upstairs lounge and the Patio at Husk are available for rental, where you can enjoy cocktail seating and exposed brick in the upstairs lounge or relax on picnic style outdoor seating while enjoying the beautiful Charleston weather. Husk signature cocktails or punch bowls offer a special twist to any event. Specialty Husk bottled cocktails are available upon request and can include personalized labels to create a sharable memory for your special moment or to promote your company for a corporate retreat. The Bar at Husk offers a more casual interpretation of the Southern plates featured in the main restaurant. Although seated dinners are not offered at The Bar at Husk, the menu can be customized to your needs, offering heartier options such as the signature Fried Chicken and the famed Husk Cheeseburger, in addition to snack items such as Pimento Cheese and Shaved Country Ham.